The tradition of Maslenitsa takes its roots in pagan times, when the Russian folks would bid farewell to stark winter and welcome long-awaited spring with mouth-watering pancakes, as round, yellow and hot, as the Sun itself, as well as with games, songs, dances and burning down the Winter effigy. The rites of this holiday are in this or that way associated with the send-off of winter and welcoming of spring. Maslenitsa is celebrated during the last week before the Lent, that is seven weeks prior to the Easter. 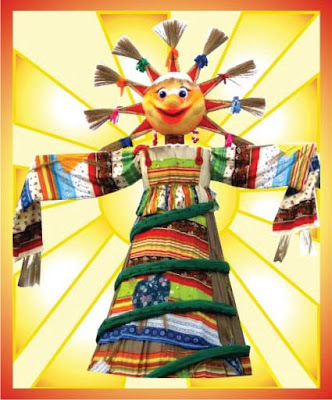 Until christening of Russia, Maslenitsa was celebrated on the vernal equinox day. The Orthodox Church, however, timed this holiday to the Lent, in order not to oppose the traditions of the Russian people (in a similar way, Christmas was timed to the winter equinox day). Maslenitsa is amusing and mischievous welcoming of spring, which brings about enlivening of nature and bounty of sunny warmth. From times immemorial people took spring for the beginning of new life and venerated the Sun as giving life and energy to the whole creation. It was in honour of the Sun that they baked flat cakes, and after leavened dough came into use, they started baking pancakes. Russian ancestors believed that when eating the round and hot pancakes reminding of the Sun they took in a bit of the warmth and might of the star of day. 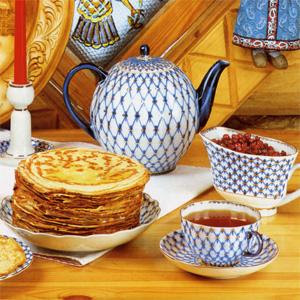 The name of the holiday, Maslenitsa (derived from maslo, which means butter or oil in Russian) obviously owes its existence to the tradition of baking pancakes. With the help of pancakes people tried to evoke the grace of the Sun and induce it to better warming of the frozen earth. Thus, they baked those encouraging little suns of pancakes. Besides, it was a custom in Russian villages to do various actions associated with a circle, such as, for example, going on horseback around the settlement several times, decorating a cart wheel and carrying it on a pole along the streets, and dancing the round dance (khorovod). Such ceremonies were believed to butter the Sun, cajole it and make it kinder. Hence is the name Maslenitsa. Every day of Maslenitsa (Pancake Week) has its own name and needs certain rites. Monday is welcoming. By this day they finished building ice-hills, seesaws and show booths. The rich already started baking pancakes. The first pancake was traditionally given to a beggar in remembrance of the dead. Tuesday is playing. From the very morning the young were invited to chute ice-hills and eat pancakes. People would invite the kinsfolk and friends with the words: "We've got the ice-hills ready and pancakes baked , please, come and try. Wednesday is regaling. On this day the son-in-law would pay a visit to the mother-in-law's pancakes. Besides her daughter's husband the mother-in-law would invite other guests as well. Thursday is merry-making. From this day on Maslenitsa unfolded to its full extent. The folks indulged in all kinds of entertainments, such as ice-hills, shows, seesaws, horse-riding, carnivals, fist fights and carousals, for sure. Friday is mother-in-law's party. Now it was the turn of the sons-in-law to invite their mothers-in-law and treat them with pancakes. Saturday is sister-in-law's party. Young wives would invite their sisters-in-law for a feast. The newlywed was supposed to give presents to her husband's sisters. The last day of Maslenitsa is Forgiveness Sunday, when everyone asks each other's forgiveness to be freed from sins before the Lent. In response they hear the traditional "God will forgive". 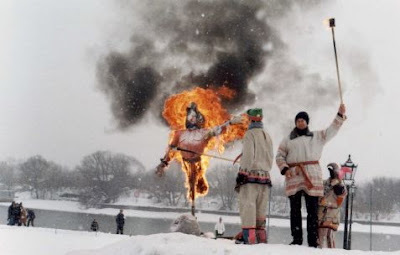 On the last day of Maslenitsa they burn down a straw effigy symbolizing winter. Thus they are sending-off winter till the next year. The rite of burning the effigy is related to the ancient, both pagan and Christian, idea of revival through sacrifice and death; it stands for the revival of fruit-bearing powers of nature, the renewal of its life power. It appears that this pristine holiday harbours profound meaning: the birth of life through struggle, death and revival. The Christian Church, however, tried to uproot this holiday as being pagan, yet it only contrived to shift its dates and shorten the festivity span from fourteen to seven days. So bake the sunny pancakes and let the winter burn away! I love these plinciki - hope I spelled it right. I could have them every single day. Thank you for sharing this tradition.